Editor’s note: This is the 9th installment of a weekly 13-part series. 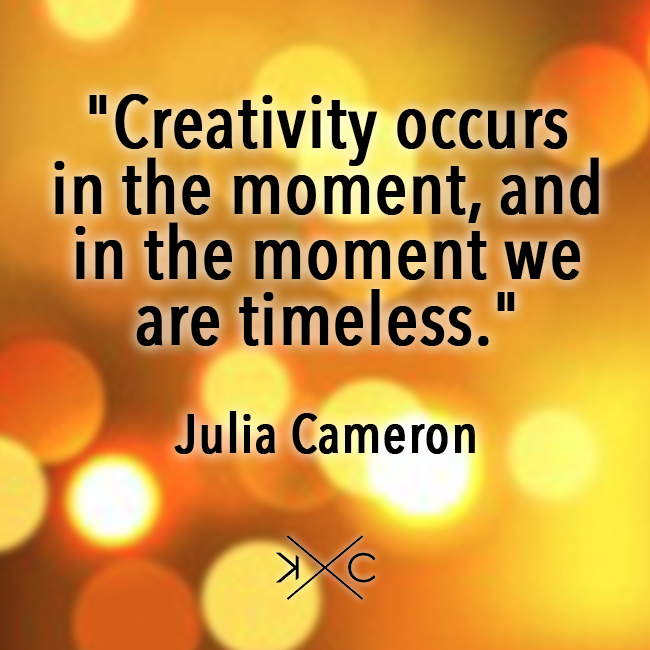 If you would like to join Jessica on her journey, we suggest getting hold of Julia Cameron’s The Artist’s Way: A Spiritual Path to Higher Creativity or checking out Cameron’s online video course. Best of luck! Each blocked artist (and, I assume, even the unblocked sort) has his or her own stray thread that they tug on during moments of self-doubt. My ego measures success by accomplishments, and if I don’t feel that I can reach milestones quickly or easily, I balk at the idea of even trying. Imagine how I feel when I fail. Many creatives are in the same boat to one degree or another. We playback memories of when our work was crushed by mentors or peers, we look longingly at the past and are terrified of the future. As a culture, we think that being artistic is kids’ stuff or a playground for retirement, not something that you do when you’re “serious” about life. So we take detours; we turn noes into dead-ends instead of open windows. We focus on the length of the journey instead of focusing on the next small step. We forget the fun of it all – the joy of experimentation. As we pull each stray thread of fear, our dreams slowly unravel. When Buzz Aldrin walked on the moon, he didn’t have an incredibly long selfie stick to capture his image, a tiny speck, traversing this enormous, dense satellite. He could only see the small steps that he was taking. However, he was aware that what he was doing, right then, in that moment, would change the course of history. Staying in the moment is a powerful way to combat fear: fear of failure, fear of past losses and noes. “Focused on the process, our creative life retains a sense of adventure. Focused on the product, the same creative life can feel foolish or barren,” The Artists Way, pg. 139. There is a great saying in the South (no, Matthew McConaughey doesn’t get credit for it – my Alabama-born grandma has been saying it for years): “Just keep livin’.” Things change. You’ll be a different person once you’ve finished reading this sentence than you were when you began. It doesn’t do any good to try to control anything. Instead, take little steps, feel the flow of the process of creating. Take action, but allow yourself the freedom to change course if necessary. I’m currently training for a half-marathon, and my coach sent me a reminder this week that seems apropos to Week 8: Recovering a Sense of Strength. It said: “Worrying doesn’t take away tomorrow’s troubles; it takes away today’s peace.” I’m trying to remember that each day – particularly as I see teeny-tiny artistic shoots poke through the soil of my soul: when an artist date inspires me to try a new medium, when my morning pages turn into poetry, when I get an idea to do something “actorly” on droughts between auditions. Instead of freaking out over what the result will be, I’ll keep my gaze on the trail, take that first step, steady my pace, and enjoy the journey.